roxy taylor | oooh… a tampa breeze, eh? oooh… a tampa breeze, eh? 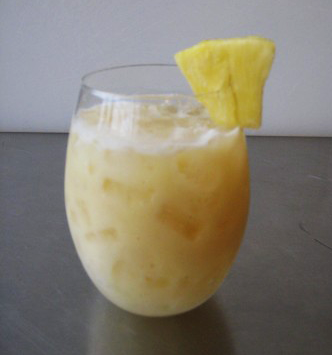 i found this drink recipe on martha stewart’s everydayfoodblog. i haven’t tried it yet because i’m an antisocial social drinker and therefore haven’t had the opportunity, but it sounds yummy! In a cocktail shaker filled with ice, add 2 ounces rum, 2 ounces pineapple juice, 1/2 ounce coconut cream, and a pinch each ground cinnamon and ground allspice. Shake well and serve over crushed ice. Makes 1 drink. i like sweet myself, so i’ll be adding the apple whiskey cocktail and the rocky road hot chocolate (OMG!) to my List of Drinks to Try At Least Once. This entry was posted in recipes and tagged cocktails. Bookmark the permalink.